Product categories of Steel Floor Deck Forming Machine, we are specialized manufacturers from China, Color Steel Floor Deck Roll Forming Machines, Double Layer Floor Deck Roll Forming Machines suppliers/factory, wholesale high-quality products of Galvanized Steel Panel Floor Deck Roll Forming Machine R & D and manufacturing, we have the perfect after-sales service and technical support. Look forward to your cooperation! 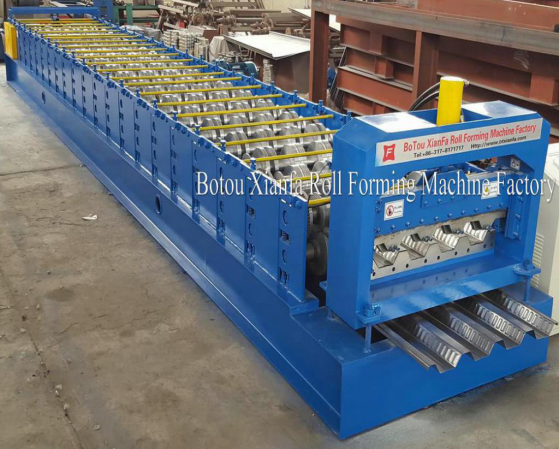 Steel Floor Deck Forming Machine: Because floor deck are widely used in building,the Floor Deck Roll Forming Machine is more and more popular.Based on the needs, we developed floor decking roll forming machine to make the production of floor deck in a huge production. We can supply various of Floor Deck Roll Forming Machine, if you provide the basic parameters or drawings,we can design the machine for you.